Definition at line 75 of file VarState.h. Definition at line 79 of file VarState.h. Definition at line 81 of file VarState.h. Definition at line 84 of file VarState.h. 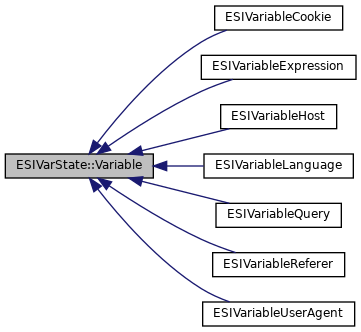 Reimplemented in ESIVariableUserAgent, ESIVariableReferer, ESIVariableQuery, ESIVariableLanguage, ESIVariableHost, ESIVariableCookie, and ESIVariableExpression. Definition at line 31 of file VarState.cc.